Lil' Bits "Home For Christmas" additional Christmas elements pack will give your Christmas creating even more spirit with these unique and special Christmas kit elements. 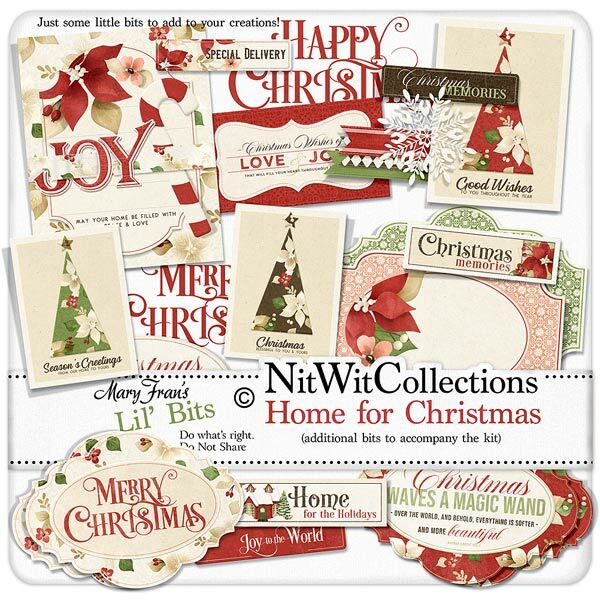 Don't miss out on these digital elements as they are not included in the FQB "Home For Christmas" Collection so please don't miss out on owning and creating with these elements! 1 Cluster including the Christmas tree, snowflake and festive ribbons - "Christmas Memories"
2 Labels to quickly add into your scrapbook layouts, mini albums and cards...one that is blank and one - "Merry Christmas"
2 Labels in the rich red Christmas poinsettia...one that is blank and one - "Christmas Waves a Magic Wand..."
1 Vintage looking Christmas label - "Christmas Wishes of Love & Joy...."
1 Christmas digital stamp sentiment - "Merry Christmas"
1 Christmas digital stamp sentiment - "Happy Christmas"
1 Sentiment label - "Home for the Holidays"
1 Sentiment label - "Christmas Memories"
1 Sentiment oval - "Christmas Waves a Magic Wand...."